February 1, 2010 Adri H.
DIY Product Softbox, originally uploaded by martigras - shooting film until 2010. I think I'm going to have to make one of these. Perhaps I'll make mine a bit sturdier than the gift box as the structure, but I think it's a great investment to show the best face of a small product. The one shown is from a flickr member and he gives his light specs, etc. for his soft box. 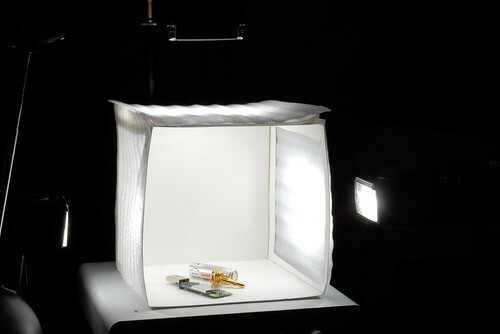 Andy's DIY Softbox is a great option... It's another soft box done with a desk lamp that shines on the product from above... here. We'll see what I can come up with! I'll post photos of the setup once it's done... and I'll post the results too!